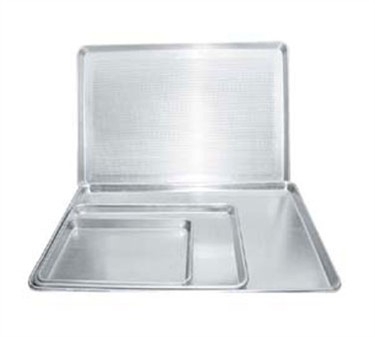 Perfect for all your commercial baking needs, the quarter size Winco ALXP-1013 Aluminum Sheet Pan, 9-1/2" x 13" is standard and dependable bakeware that can be found in bakeries, restaurants and cafes. Made of 3003 aluminum with a closed bead galvanized wire reinforced rim, this sturdy baking sheet is rust resistant and will resist warping and bending even after multiple uses. This baking sheet is easy to clean and will fast become a favorite in your food establishment for baking sheet cakes, cookies, or even broiling food.